After departing Columbia, South Carolina, we headed generally towards Wilmington. We were, for once, ahead of schedule so we thoght we might stop at some convenient half way point. 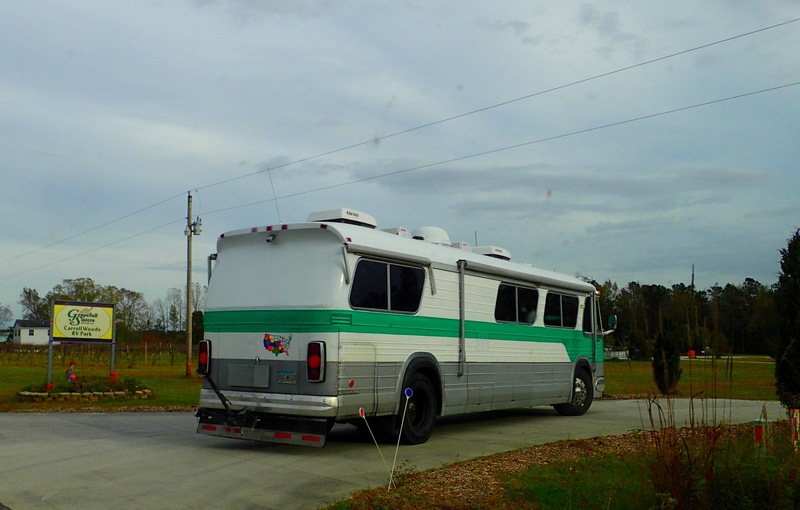 The latest version of our ever changing plan was to drop off The Big Kahuna at Wilmington RV and continue on to Norfolk, VA in Loki, spend a couple of days with relatives, then come back to Wilmington to celebrate my Mom’s birthday and Thanksgiving. As we cruised down some of the back roads we seemed to be having an unusual amount of difficulty transitioning from low gear (turbine) into second gear (direct). Then I noticed the transmission temp rising above the comfort zone so we pulled over and cut the engine. I did a visual inspection and checked the transmission fluid level, which looked low. Getting an accurate fluid level in these old Allison’s requires checking it within a few seconds of cutting the engine, but given our history of leaks I went with “it looks low” and added two quarts. After waiting a bit for the temps to cool, we started up and headed off. Oh wait, that would be too easy. What actually happened is we attempted to start up and head off, and we didn’t even get a click out of the engine. We had been noticing an increasing reluctance to turnover of late, something different than the problem we experienced in Nebraska. Then the engine would turn over but just not catch. We resolved that problem with some new fuel check valves. The newer problem was the engine would not turnover at all, suggesting an electrical rather than a fuel or mechanical problem. Usually, lately, this meant that it took a couple of tries to get things started. Today however, fifty tries did nothing. After the fourth or fifth attempt I pulled out the generator and battery charger hoping it was something as simple as dying starter batteries. But even with the batteries registering fully charged, Kahuna just wouldn’t turn over. We were on back roads, which meant no Flying J, Pilot, or Love’s was likely to be nearby, but we had at least stumbled across the one spot that had a wide pull out in an otherwise shoulderless stretch, and the lot we were in front of did not have a residence on it, so we were at least safe, secure, and unlikely to get hassled. After a couple of hours of twiddling our thumbs, The Big Kahuna decided we had waited long enough and fired up on something like the 51st start attempt. Breathing a sigh of relief, we immediately decided two thing: we would stop for the day at the nearest affordable RV park, and we would arrange for a mechanic in Wilmington to look at the two issues we were having with the bus during the week we would be local. While idling beside the road we checked Passport America’s website and found a great deal on a quaint RV park half an hour away. 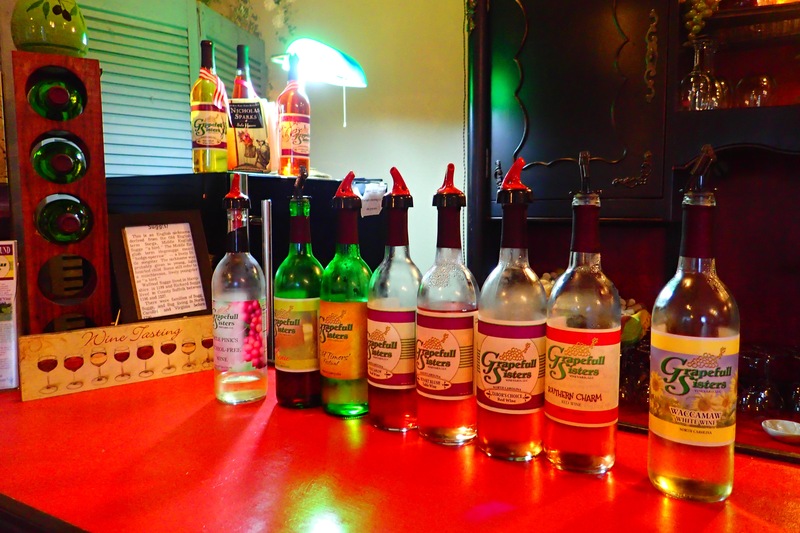 Carrollwoods RV Park is associated with the Grapeful Sisters, a family owned vineyard producing a range of wines from what we would later learn is the only actual domestic grape in the US, the muscadine. 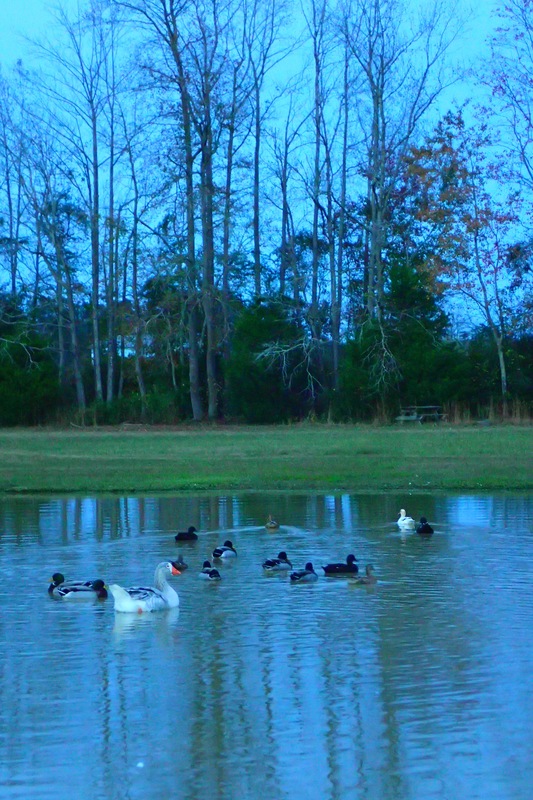 We pulled onto their property and it was instantly rewarding, like we had arrived at close relative’s home. 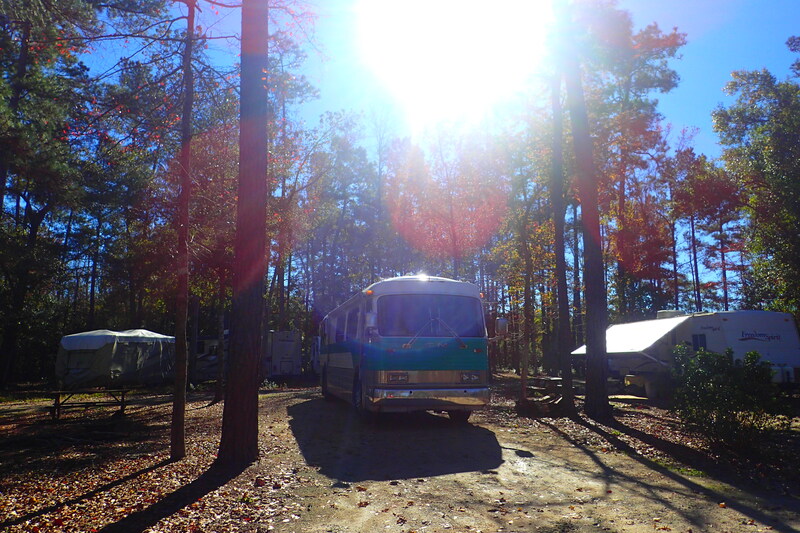 The RV park is situated on a beautiful piece of property in Tabor City, NC, and has been owned by the same family for at least seven generations. 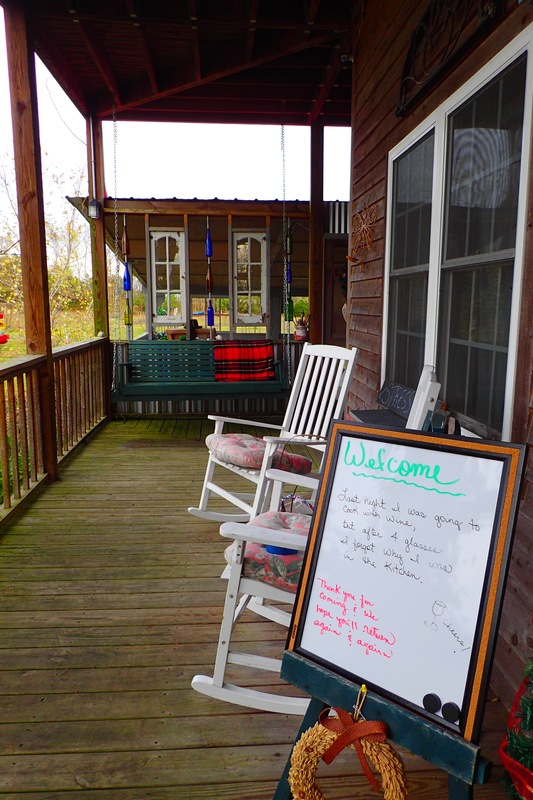 It has an inn, a tasting room, a nicely wooded RV park, a huge dog run, a duck pond, and the family’s three lovely, home schooled and always barefoot children are generally running about. 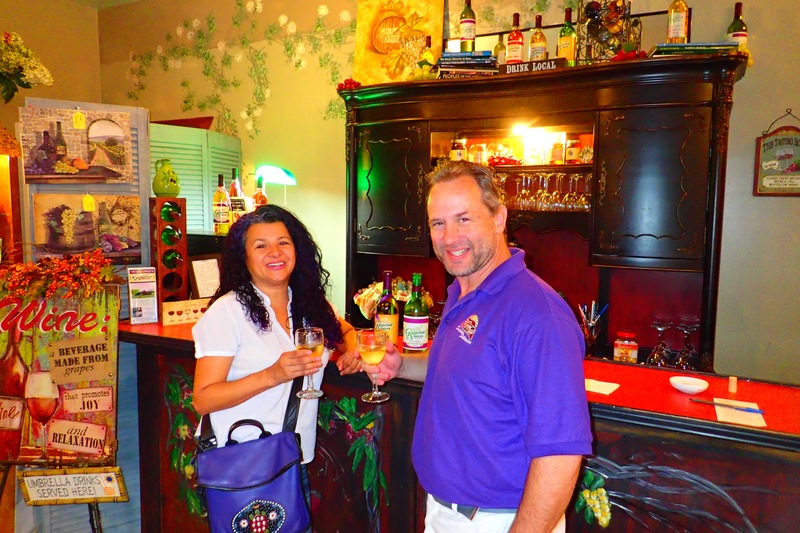 We parked, hooked up, cleaned up, and headed straight for the tasting room, where the Grapeful Sisters, Amy and Sheila, gave us one of the most educational tastings we have experienced. 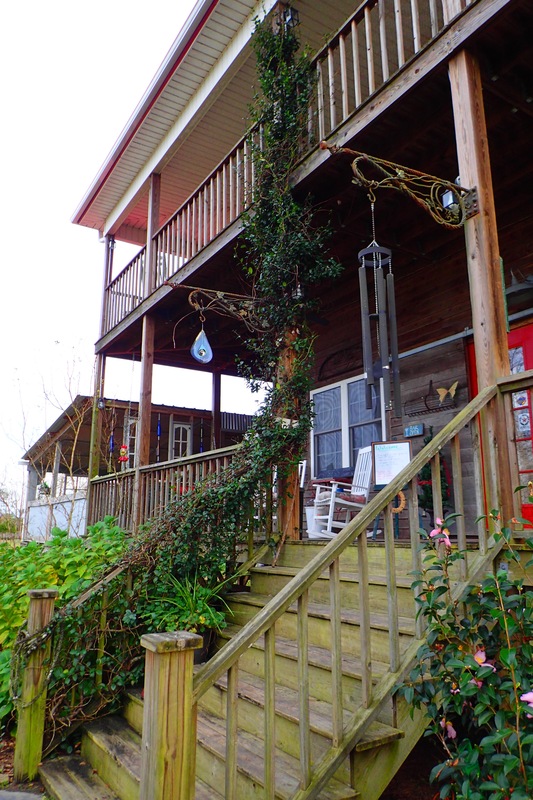 While muscadine grapes are generally thought to produce only sweet wines, Amy made sure we understood that they were capable of producing the drier sorts of wines we prefer. We had planned on this being just a one night stopover, but we like it so much we extended for another night, just relaxing in the comfort and safety of their park. 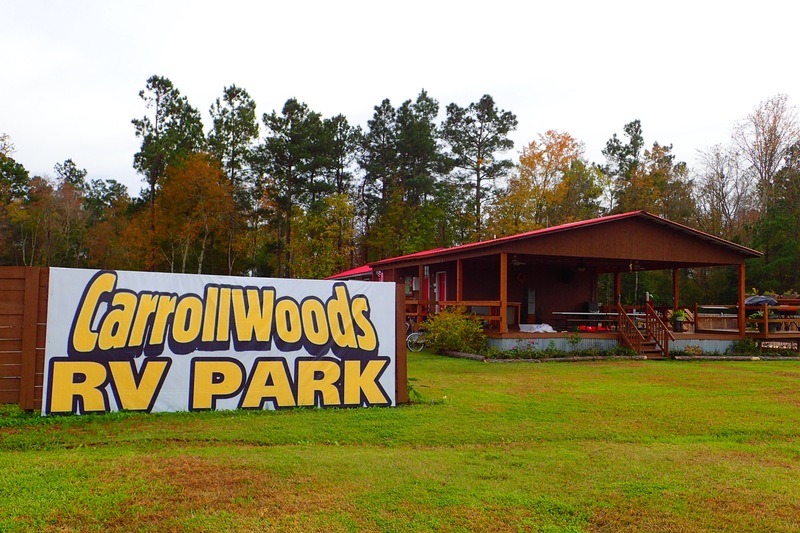 We will certainly consider Carrollwoods RV Park again when we head north next spring. Love those little stopovers that turn out to be gems! Looks like a great place to spend a couple of days. Indeed it was. Aside from the break down issues, we have had great luck of late with our campground choices.